Guys, it's cold. I'm not particularly upset about it because I like cold weather and it's mid-November, it's time. I also like the cold because it means its fantastic coat time. There are a lot of trends for outerwear this year. From cocoon to wrap to mixed media; but the one I really love because it mixes utility with sass, is shearling. 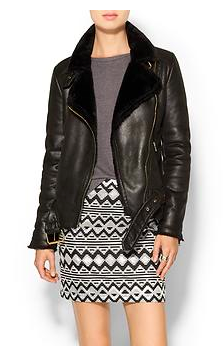 I love that this jacket mixes motorcycle style with blazer notched label. A great blend of rocker and prep. 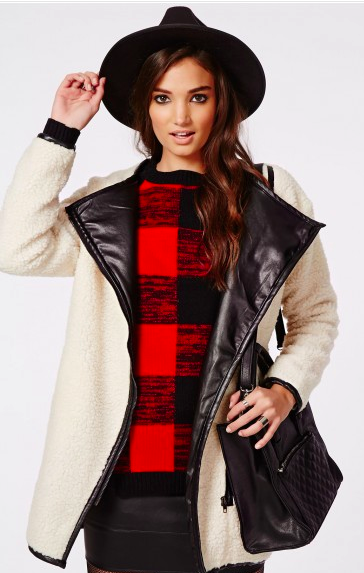 A crazy twist on shearling with this longer option. So much sass. There are jackets and then there are jackets. This is the latter. Attention to detail like an asymmetrical zip and waist hem buckle. A classic look with khaki and cream. I love the oversized fold over collar. 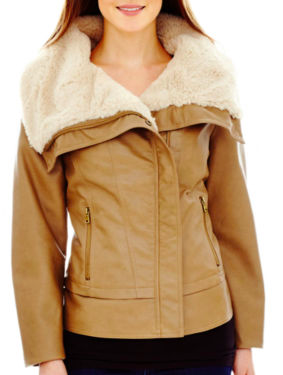 Keep warm and cozy this winter with shearling. It mixes comfort with chic and who doesn't want that when it's frigid outside?